Manage your guild status in a fantastical realm! You and your blokes have been unfairly banished and stripped of everything but a few shillings and table scraps. Undaunted, you journey to a strange land of Feudum to reclaim your honor. 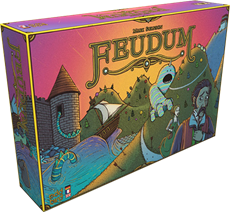 Feudum is a deeply nuanced game for 2-5 players that rewards resource management and skillful planning. Six uniquely powered characters and multiple paths to victory make for an ever-changing, open-world experience each time you play! Back the game's new expansion "The Queen's Army" right now on the Kickstarter.